Tired of short, thin eyelashes that won’t curl? 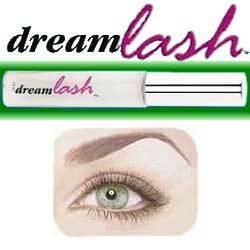 Dream Lash is the nighttime treatment that conditions lashes for a longer, fuller look. Unlike mascara, special proteins penetrate each lash, strengthening and conditioning, helping to produce a more beautiful, youthful look. Hypo-allergenic. Clear. Also thickens and defines eyebrows. See a dramatic difference in just a few days!